From nonprofit workshops to lucrative college consulting businesses, here's the story of how organizations leverage the Harvard brand to advance their interests. Armed with over a decade of teaching experience and a desire to teach a variety of subjects, Dominique Padurano ’93 faced one last challenge—what to name her new tutoring company. From the start, that nod to Harvard helped draw in clients. “I think that was what got me in the proverbial door,” Padurano says. Indeed, the Harvard brand has overwhelming power—Padurano is not alone in trying to monetize its influence. Wander through Harvard Square and you’ll see dozens of businesses that deploy the University’s name. Crimson hoodies and t-shirts dominate storefronts. 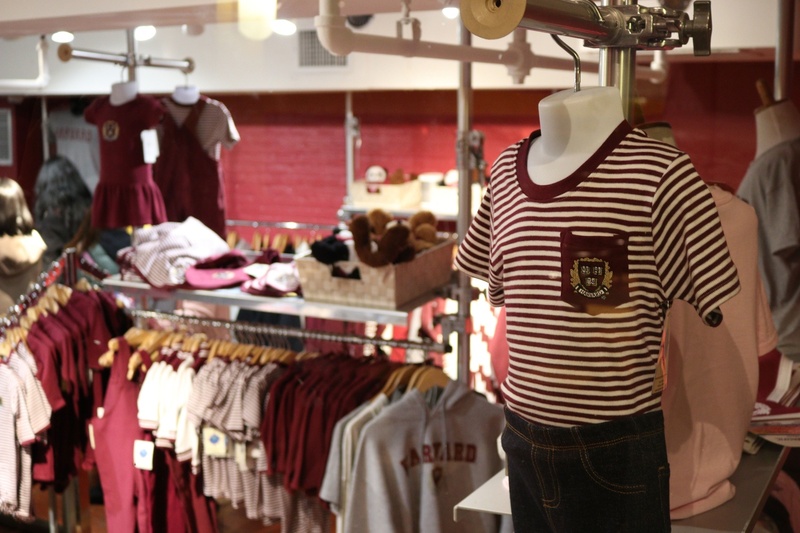 At the very heart of the Square, Harvard gear peeks out from the windows of Out of Town News. Across the street, a bold crimson sign indicates the Coop. And rights to the name don’t come cheap: Companies pay through the nose for licenses to sell Harvard-branded clothing at stores like Forever 21 and Vineyard Vines. Consumer goods aren’t the only products that benefit from being Harvard-branded. Crimson Coaching is one of many education-focused businesses that seek to take advantage of the unique power of the Harvard name. These organizations tend to offer similar services: international conferences, tutoring, or college application consulting. The profits derived from the name can be huge. In a “non-exhaustive” list published by the University, Harvard has registered over 150 trademarks on everything from the Veritas shield to CS50. 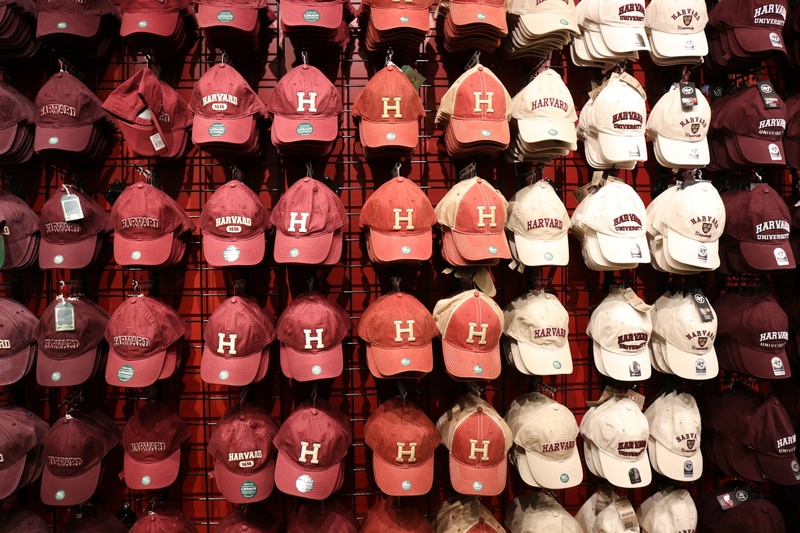 Royalties from Harvard-branded merchandise sales amount to around $500,000 a year. As a result, the University carefully polices its brand. The Harvard Trademark Program licenses the University’s trademarks and investigates unauthorized use of the Harvard name. Within the College, the Office of Student Life places careful restrictions on how a student group can claim Harvard affiliation. Similar bodies exist for the University’s other schools. The result is a complicated relationship between organizations seeking Harvard affiliation and administrators seeking to protect the brand. Inside the University, groups acquiesce to Harvard’s demands in order to maintain access to the name. Outside, businesses toe the line, choosing words and imagery that evoke Harvard and the Ivy League without misusing the university’s numerous trademarks. Regardless of official affiliation to the University, organizations ranging from nonprofit workshops to lucrative college consulting businesses leverage—and sometimes exploit—the Harvard brand to advance their interests. Houman D. Harouni, a lecturer at the Graduate School of Education, has received numerous invitations to speak at conferences around the world. He considers his popularity a testament to the power of the Harvard brand on the global stage. The Harvard brand is especially valuable in Asia, where student groups find a lucrative market among high school students. Nearly a dozen student groups at Harvard offer educational conferences and workshops in China, Korea, Taiwan, Japan, and India, sometimes making hundreds of thousands of dollars a year. Bolstered by their affiliation to the University, many of these groups attract a sizeable client base from day one. Harvard Model United Nations, for example, runs four-day United Nations conference simulations for high school students. While the main conference is hosted in Boston in January of each year, HMUN also hosts two international conferences annually in China and India. “The Harvard name has massive cachet internationally, probably even more than it does in the United States, so running a Harvard-sponsored conference kind of gives you a leg up over a lot of the competition because the name draws people in,” Bowers adds. Qe Ti describes the Harvard name as a “quality warranty.” Ti is the chief operating officer and cofounder of Alpha Partners Education, the Beijing-based organization that helps organize HMUN China’s conference. “In the eyes of Chinese parents and Chinese students, Harvard is the mecca of college, is the mecca of education, so the conference absolutely benefits from the name of Harvard,” Ti says. Other organizations seek to emulate Harvard’s academic model, sustaining their conferences with their continued use of the Harvard brand. Groups such as the Harvard Vietnam International Educational Teach-In and the Harvard College Japan Initiative send dozens of undergraduates abroad to lead workshops and seminars. Of these organizations, Harvard Summit for Young Leaders in China is one of the largest and most established. Run by the Harvard Association for U.S.-China Relations, HSYLC operates three nine-day conferences each summer in Beijing, Shanghai, and Hangzhou. Chinese high school students attend courses taught by Harvard undergraduates while participating in various extracurricular activities such as dance and sports. Many former participants say that HSYLC’s affiliation to Harvard drew their attention. Hehe “Hannah” Shen ’19, a current HAUSCR board member who participated in HSYLC as a high school student, agrees. “The Harvard name definitely weighs a lot in this decision,” she says. The trust in the Harvard name has translated to success for HSYLC. In 2017, more than 1000 Chinese high school students attended classes taught by about 100 Harvard undergraduates. HSYLC received more than $280,000 in revenue during the 2015 fiscal year, the most recent year for which public records are available. Bowers says the same trend held for HMUN. While the Harvard name may have helped establish HMUN initially, its continued success drew mainly on the reputation the conference had built up over the years. In fiscal year 2015, Harvard Model United Nations programs made $760,043 in revenue. On the global stage, Harvard’s presence is overwhelming, competing with only the largest universities such as Cambridge or Oxford for name recognition. Domestically, Harvard faces more competition from regional powerhouses and nationally-ranked schools like University of Southern California and Cornell. The self-described “largest student-run company in the world,” Harvard Student Agencies, is another prime example of the Harvard brand’s power in the United States. HSA contains 14 agencies, which sell products and services from custom apparel to dry cleaning to translation. One of these agencies benefits particularly from Harvard’s association with high-quality education: HSA Tutoring, which offers a constellation of services like test preparation, academic workshops, and the Summer Business Academy, a week-long entrepreneurship course for high school students. Each of these educational services touts a Harvard affiliation. According to the HSA Tutoring website, private tutoring packages vary in price: The one-hour 1636 package costs $75, while the 20-hour Veritas package costs $995. Over the summer, HSA tutors were paid $20/hour, according to job postings publicized in College Facebook groups and over mailing lists. Harvard Student Agencies, a registered non-profit 501(c)(3) organization, made $1,870,888 total revenue in fiscal year 2016. 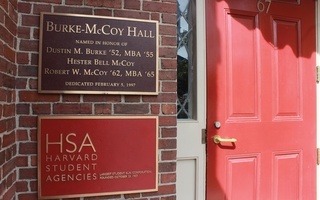 In its Form 990 from fiscal year 2016, HSA states that its mission is “to conduct business enterprises for the benefit of students of Harvard University who are in need of financial assistance to defray the the expenses of their education.” HSA aims to provide job opportunities for College students. Beth A. Simpson ’99, a lecturer at the Graduate School of Education, challenges the idea that students who have done well on their own standardized tests are prepared to tutor others. “Just because you experienced an assessment doesn’t mean you know how to compose one,” Simpson says. According to Massa, after tutors have been selected, they undergo training. However, several HSA tutors say the training may not be sufficient. Based on her experience, Grace C. Eysenbach ’20, a former HSA tutor who taught 9th grade physics and computer skills part-time over the summer, said that HSA’s training process for tutors was only about an hour long. The trainings focused more on HSA tutoring policies rather than instruction on how to teach specific subjects. Joan Rooney, Vice President for Tutor Management and Support at The Princeton Review, emphasizes the importance of making sure tutors are trained to teach. She says that applicants for Princeton’s On Demand Tutoring, a 24/7 online homework help service, complete a one-hour mock teaching session and a qualifications check. After tutors are selected, they remain on probation for up to 60 days, during which time they are assigned a mentor who has “expertise in online tutoring” with The Princeton Review who observes their work and provides feedback. Even after the probationary period, mentors continue to check in with tutors, only less frequently. “It’s important to make sure that people delivering the tutoring are using some pedagogical skills and techniques,” Rooney says. “We do have many different services, and we have set ways that we’ve worked with advisors to develop to make sure that all of our tutors are up to par,” Massa says. She adds that after each program they run, HSA collects feedback to pass on to their tutors. According to Rameen A. Rana ’20, Managing Director of HSA Tutoring, the company’s main competitors include Kaplan, Signet Education, Cambridge Coaching, and The Princeton Review. According to Rooney, The Princeton Review charges $39.99 for its one-hour On Demand Tutoring package, which focuses on general academic help. The Princeton Review does charge higher prices for its standardized testing tutoring packages. Compared to some other student-run tutoring agencies, HSA charges more for its services. Student Tutor, a company that hires college students and recent graduates as tutors, charges up to $55 an hour for academic tutoring and up to $60 an hour for standardized test prep, compared to HSA’s $75 one-hour tutoring package. Rooney says she thinks Ivy League branding “definitely” helps tutoring companies attract business. Various companies attract customers not only with the possibility of Ivy League grades, but also with admission into Ivy League schools. Those who are admitted to Harvard often feel the pull of the brand first-hand. For Jordan O. Johnson ’21, getting into Harvard didn’t just mean an acceptance letter in the mail and a free t-shirt from the Coop. Her acceptance also brought 400 new Instagram followers. Inspired by the college admissions frenzy, Johnson started her own college consulting company, Ivy Grad Consulting, based in her hometown of Bethesda, Maryland. “I was like, ‘What can I sell that’s cheap, and I can sell for a lot?’ and in my area, that ended up being college consulting,” Johnson says. Johnson is not alone. The global fixation on admission into Harvard—and, more broadly, elite universities—inspires many entrepreneurs to launch college consulting companies for eager high school students engaged in the race for admission to selective colleges. The result is a growing number of college consulting firms that reference elite schools in their titles. They boast names such as “Crimson Education,” “Harvard Square Consulting,” and “Ivy Coach.” Their websites often reference the Ivy League specifically. Words such as “selective” and “elite” are a common refrain. Some companies introduce prospective customers to their consultants, emphasizing their alma maters—a mix of the most selective universities in the world. Johnson’s company, Ivy Grad Consulting, seeks to provide specific advice for students at select college preparatory schools. An hour’s worth of consultation costs $95. Johnson says she chose the name to highlight her qualifications and to strategically better reach her “target markets”: communities that have a culture focused on selective college admissions. Shortly after she launched Ivy Grad Consulting, other recent high school graduates reached out to Johnson, offering to consult for the company. Kahlil Greene, then a Yale-bound senior, sent his resume to Johnson. One reason she chose to hire him was that he attended a competitive, predominantly wealthy high school. Ivy Grad Consulting includes specific packages that cater to students at Walt Whitman High School and Poolesville High School, two nationally ranked Maryland schools—and the schools that Johnson and Greene attended. According to Johnson, the culture at both Walt Whitman and Poolesville is highly centered on gaining admission to a selective college. Levy says that most consultants believe their industry should focus on matching students to the school that best fits their needs. Consequently, they regard companies invoking the Ivy League in their names as unethical. “There’s a concerted effort to prevent consultants from using those types of names—Ivy this or Harvard that or Princeton this—in the name of their firms because it’s conveying absolutely the wrong message,” Levy says. The IECA closely scrutinizes consultants who use the Ivy brand, according to Rossbach. “If [the Ivy brand] pops up, we have a conversation with the person asking them why that’s there and asking them to remove it because it’s not really the focus we have in our organization at all,” Rossbach says. Ivy Grad Consulting is not affiliated with the IECA. She admits that her company may contribute to the culture of obsession over Ivy League admissions “to a certain extent,” but that larger companies deserve a greater portion of the blame. Henry Moodie knows a thing or two about branding. A few years ago, the Extension School student launched Harvard HELLO (Harvard Extension Leadership Learning Organization), a student club that sold leadership workshops held in various campus facilities. When asked about the incident, the Trademark Program said that it did not comment on individual cases. Moodie and collaborators were told to suspend club activities. They decided to drop the venture. Finally, Moodie turned his focus back to Ivy League schools and other elite colleges. His newest venture, Ivy Grad, connects student “consultants” at elite universities with short-term job opportunities offered by various employers, Moodie’s “clients.” Moodie says he selected Ivy League students as his consultant base because their alma mater “prequalified” them. Ivy Grad’s website featured images of four people labeled with what Moodie says are the names of his student consultants. When asked about the images, he clarified that although the names were correct, the pictures were stock images because the consultants wished to remain anonymous. Later, the names were removed. Still in its beginning stages, Ivy Grad capitalizes on the power of the Ivy League brand like many of its more established peers. Drawing on the academic legacy provoked by the name, these education-related organizations leverage the Harvard brand in order to achieve their goals, whether those be to host international conferences, promote tutoring or college consulting practices, or to connect college students with career opportunities. If Ivy Grad does well, Moodie says, he will expand. Tutoring in N. H. 1, 2 and 4. W. H. Page, Hollis 16. Tutoring in N. H. 1 and 2.